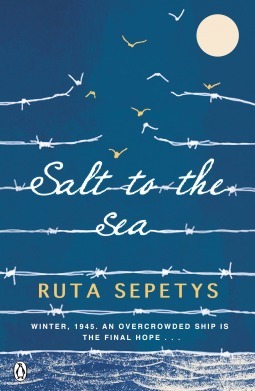 I will read anything by Ruta Sepetys so naturally I bought this book. Since I had read her other book I knew there would be tears. This book had so good ratings that I knew I had to have it. This book did not disappoint me. I liked how the plot was told through the four points of view. It added extra dimension to the plot. I liked the plot and how it gripped me. I could not put the book down( thankfully I was in a car for 14 hours so I had a lot of time to finish the book,) The author really has a talent for writing plot twists that are not easy to guess. I thought each and every one contributed to moving the plot forward. Each and everyone of them have dark secrets that effect each other;’s fates. I thought each of the four voices had great character development and were not flat at all. They were complex and shaped characters. I cried after I finished it. It was so sad and so good at the same time. Everyone needs to read this wonderful book.